CAVEX® wheel sets are optimized with the most modern calculation tools and designed for highest loads. 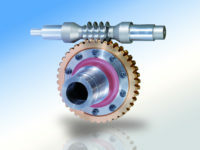 The reliability of CAVEX® gear wheel sets have got a high weight in rough operating conditions. We thoroughly persuade of each gear wheel set. After the geometric testing of the worm and wheel the wear pattern is checked.